The location of the eyes in the front of the face (rather than at the side as in the rabbit or horse) enables the cat to calculate the exact distance it has to leap in order to catch prey or safely land. Its pupils dilate at night to let in as much light as possible and form a slit by day. The cat’s visual sharpness is 10 times less than man’s but is compensated for with a retina whose structure provides it with “movement detectors” to help it locate prey. (Prey, or toys, must move to be seen). The cat can scan a yard with a single sweep of its eyes. 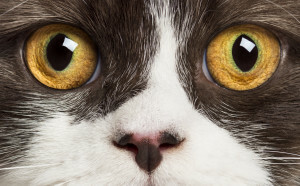 The tapetum, a reflective layer at the back of each eye, increases the amount of light passing through the retina and enables the cat to see well when the light intensity is low. Be sure your cat’s litterbox areas are cat-friendly and are equipped with night-lights.